About once a year our family plans to take a vacation. Getting the chance to have uninterrupted family time is something I look forward to. 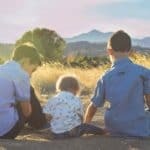 With the kids in school and a husband who works long hours, quality family time just doesn’t seem to happen often enough. This year we wanted to do something extra special for the kids and take them somewhere they’ve never been before, somewhere tropical, and somewhere international. 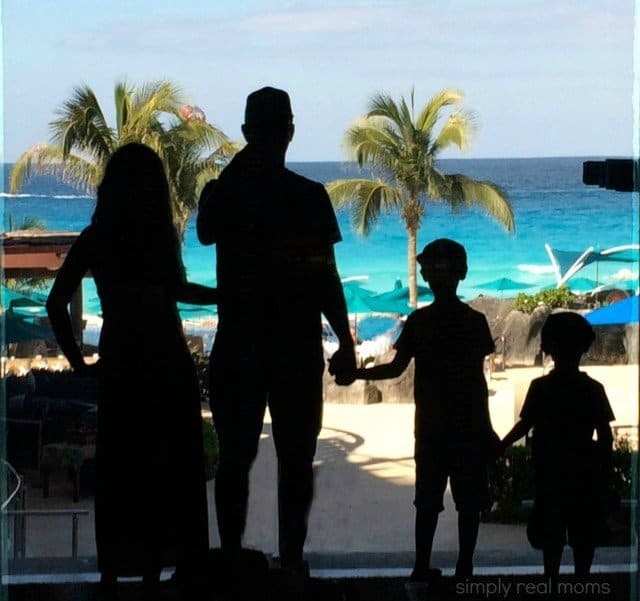 Having recently traveled to Cancun with my husband, we fell in love with the atmosphere of Cancun and knew it would be the perfect destination for our family. Finding an international resort that is family-friendly is not always an easy task and there are some things to consider as a parent. Does the resort offer a kid’s club? Does the resort have a kid’s pool? Is there an option for a family suite? 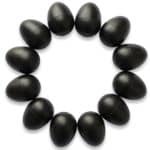 Have you checked travel review sites to see if reviewers listed it as “good for kids”? 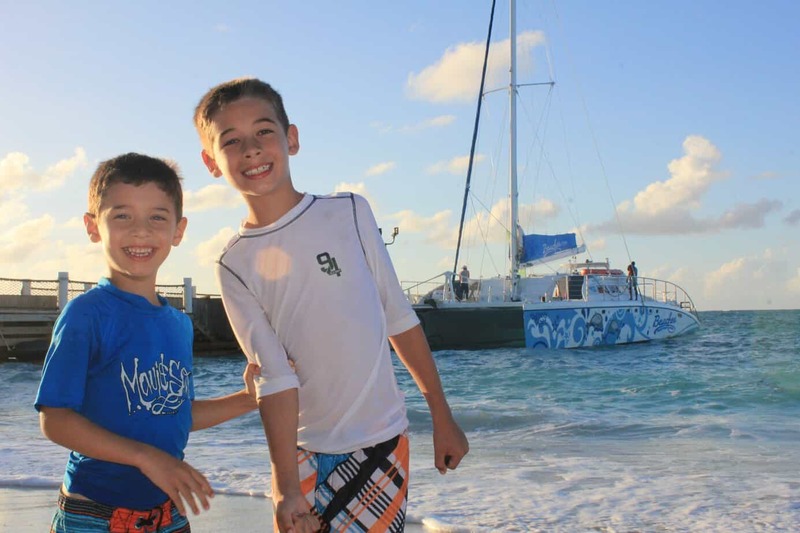 While these may seem like insignificant questions, they can play a huge part into making sure your kids are welcomed at the resort by not just the staff, but other vacationers as well. 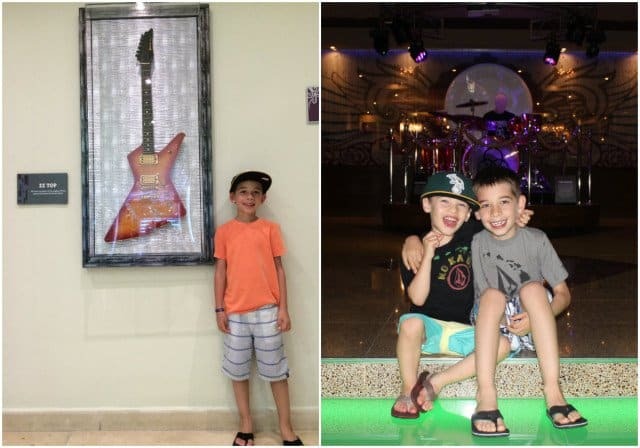 For our family, the Hard Rock Hotel Cancun seemed like a perfect fit. Not only is this resort family-friendly, it is also all-inclusive, which makes traveling international with kids much easier. From the moment we arrived at the Hard Rock, we were treated like rock stars. We were greeted right away and whisked into the VIP check-in area where they took our bags and offered us drinks and snacks. It was a wonderful way to be welcomed into the resort and to learn about all the amenities that were available to us. .We were given a tour of the resort before heading up to our room. The exterior of the resort gives you a glimpse as to what you will find once you step foot into the doors. As you can imagine, the interior of the resort is decorated with memorabilia from musicians of all genres which screams rock and roll. 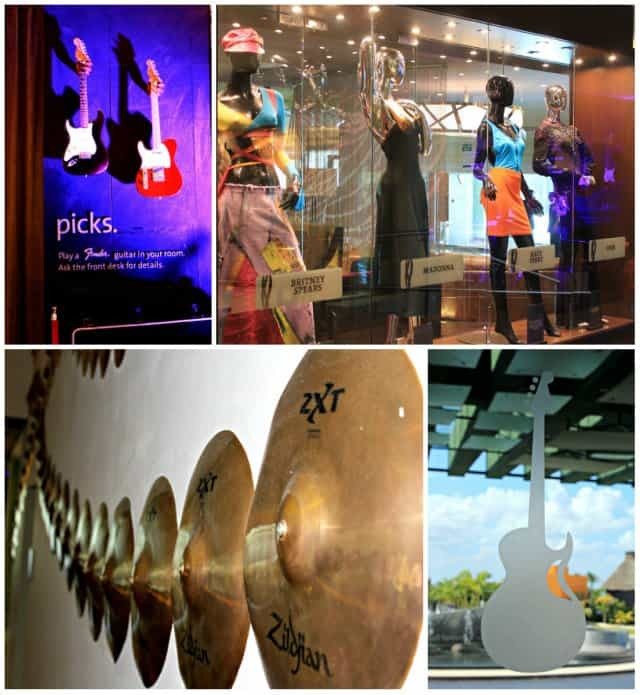 Our kids were in Heaven as they looked around and saw all kinds of musical instruments. The resort will even rent you out your very own Fender guitar during your stay, which would be perfect for a teenager on vacation. Being that we were on a family vacation, we stayed in a Family Deluxe Suite which gave us two connecting rooms— One master room complete with a king sized bed, and one room with two full beds. 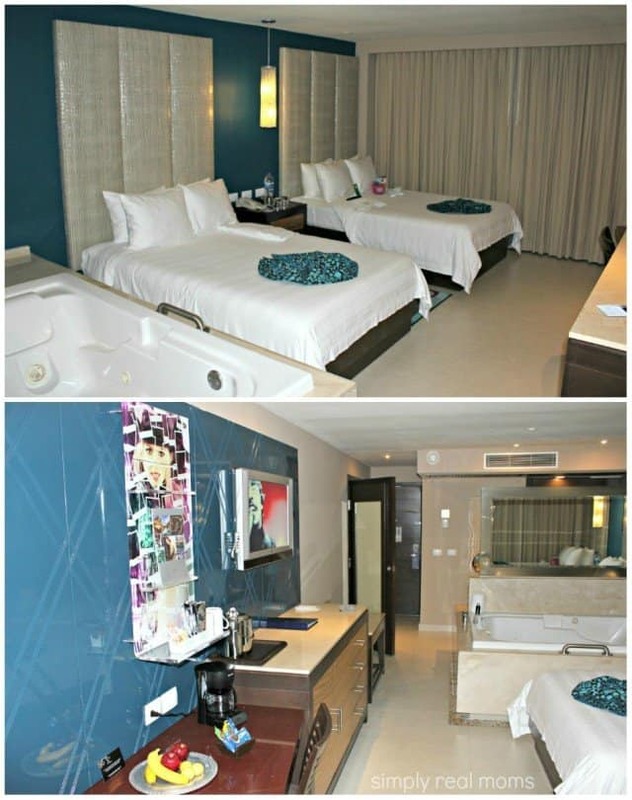 The master room comes with a king sized bed, over sized jacuzzi tub and a fully-stocked bar. 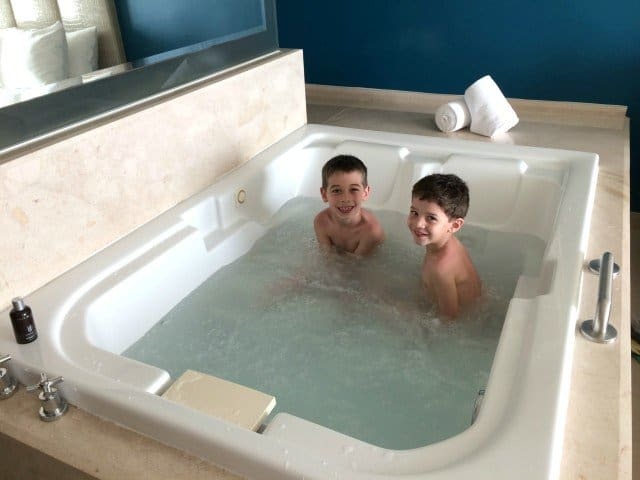 The kid’s connecting room comes with two full beds, over sized jacuzzi tub, and a fully stocked non-alcoholic bar complete with juice boxes, milk, cookies, candy, and fruit. 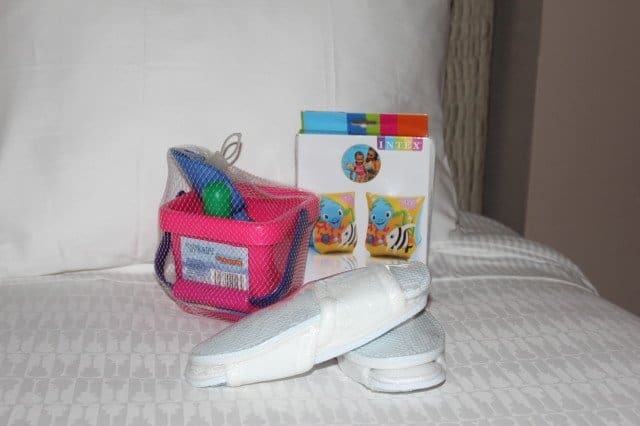 As a special gift to the kids, they also put a fun package on the bed which included beach toys, water floaties and kid sized slippers. When I say over sized tub, I really mean over sized. The jacuzzi tub could have easily fit all four of us comfortably. There is only complaint we have about the Family Deluxe Suite. The Family Suites come with an Xbox and my son was really excited, but every time we called the concierge to see if they had a game available, they did not. We were there for four days and would check multiple times a day to see if anyone returned a game. 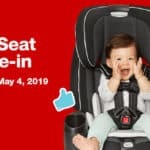 You may be thinking why on earth would a child want to play a game while on vacation in paradise, but there are times, especially when traveling with children, that you want to rest in your room a bit before getting ready for dinner, or even before bed. It would be extremely helpful if the resort had a day limit on their games/controllers, possibly letting you only borrow it for a 24 hour period so other kids have a chance to play the games as well. 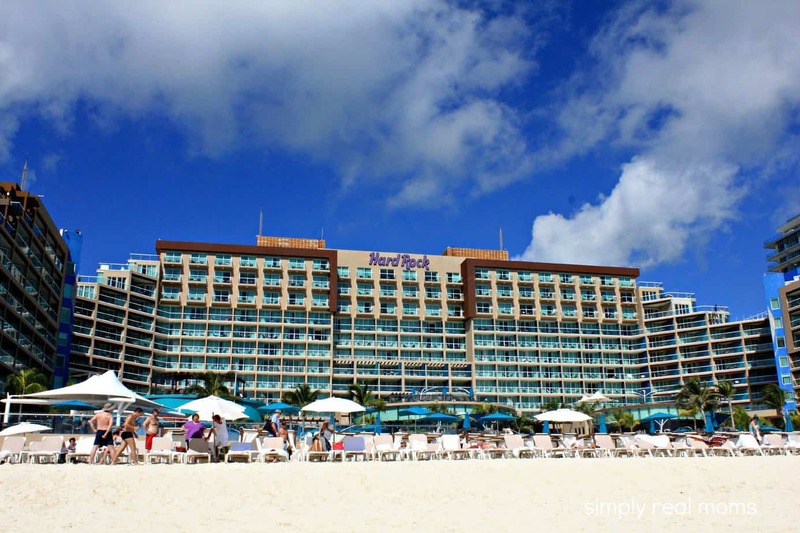 One of the best things about the Hard Rock Hotel is how close the resort is to the beach. After all, isn’t that one of the main reasons to visit Cancun? The Hard Rock Hotel Cancun is considered a beachfront resort which means the beach is literally within steps. We spent a majority of our vacation playing in the warm and clear Caribbean Sea. It was so convenient to have the hotel right there so we could take bathroom breaks and walk back to get drinks and snacks when needed. For some fun in the sun without leaving the resort, you can check out the pools at the Hard Rock Hotel. The main, freestyle pool, offers two swim-up bars with views of the ocean. Both my husband and kids loved this amenity because you could order virtually any drink you desire. From alcoholic to non, the swim-up bar makes swimming that much more fun. 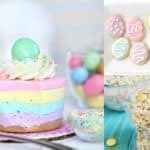 If the kids want something targeted more for them, then head on to the Kid’s Club. Connected to the club is one of the coolest kid’s pools I have ever seen. 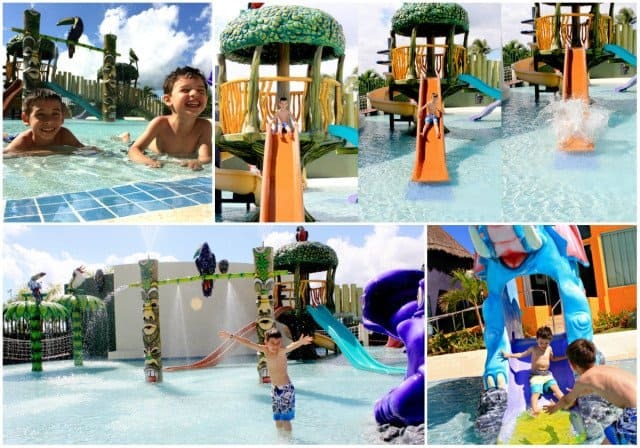 Complete with water slides and a huge water play structure, the kid’s can run around in a child-safe environment. 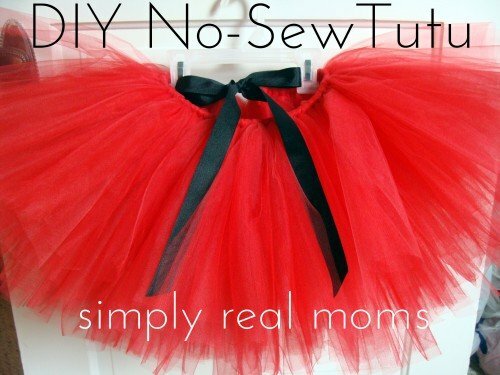 This is perfect for toddlers who can’t quite swim yet as the water is shallow. One of the best reasons to travel to an all-inclusive resort is the unlimited amounts of food and drinks. Zen- Zen offers an extraordinary fine dining experience composed of expertly prepared Asian cuisine. Ciao- Sit down to an Italian feast. In the mornings, indulge in a sumptuous breakfast of International fare. In the evening, the restaurant becomes a dazzling setting for savoring the finest Italian specialties and expertly prepared pasta dishes. Ipanema- When the sun sets on the Caribbean Sea, Ipanema is the place for an elegant, authentic Brazilian steakhouse experience, complete with rodizio service in true Brazilian style. Indulge in the finest cuts of beef, pork, poultry and more, cooked fresh over spitfire and sliced table-side just for you. Frida- Discover the fiery flavors, spices and passions of Mexico at Frida, serving traditional Mexican cuisine in a festive atmosphere. The a la carte menu offers regional specialties, paired with tasty margaritas and tequilas. The Hard Rock Hotel knows how to entertain. 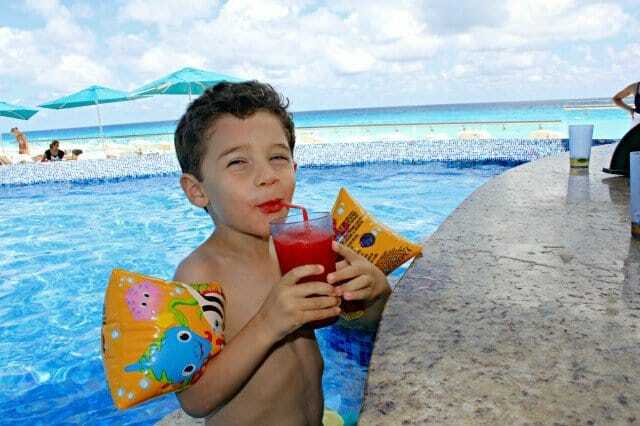 This is the third resort in Cancun I have stayed at and definitely one of the most fun. 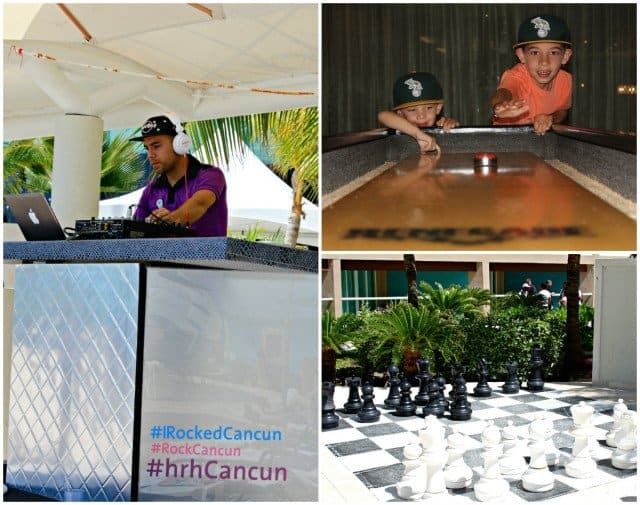 The Hard Rock Hotel offers indoor amenities like pool tables and shuffle board and outdoor fun like a giant sized chess board, and a DJ at the pool doing water aerobics, quiz games, bean bag toss, and playing live music. In the evenings they offer free live entertainment in their amphitheater that is sure to get you moving! 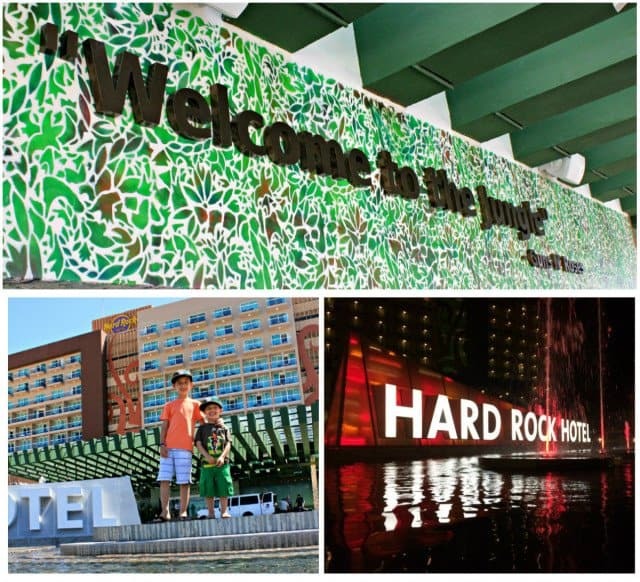 Whether you are planning a family vacation or taking a trip without the kids, if you are looking for an all-inclusive resort that is packed with fun, we recommend the Hard Rock Hotel Cancun. I have never had this much fun at a resort and can’t wait to visit again. 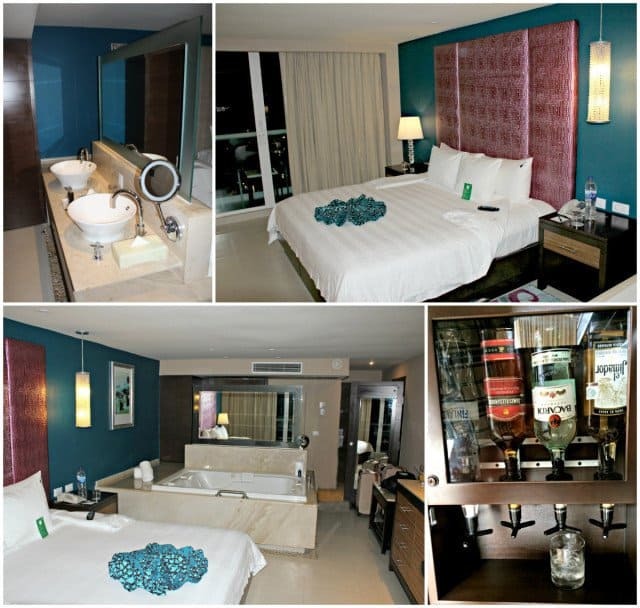 For more information about the Hard Rock Cancun or to book your next vacation, visit www.hrhcancun.com. Thank you Hard Rock Hotel Cancun for hosting my family’s stay. All opinions are mine. Saw this on Twitter. We have been wanting to plan a vacation for when our kid’s are on summer break. The Hard Rock sounds great! What a thorough review. Thanks! The Hard Rock Cancun was amazing! The whole family had the most wonderful time. Great food, great setting, awesome staff! Can’t wait to go back. 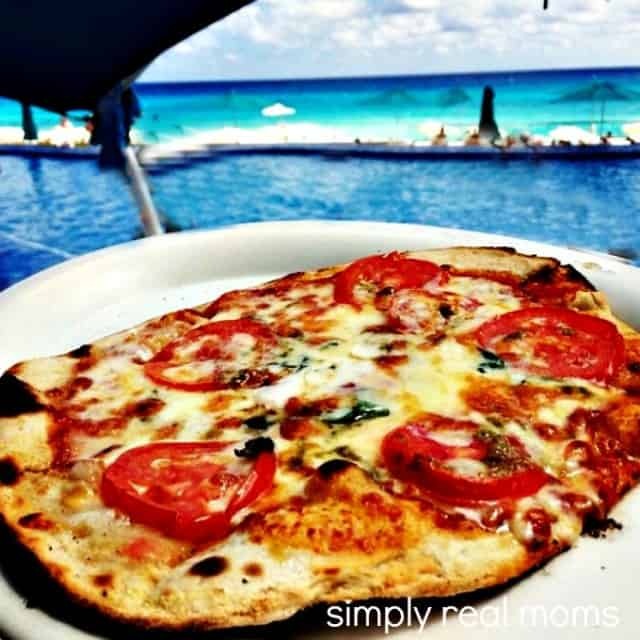 Great review Simply Real Moms! 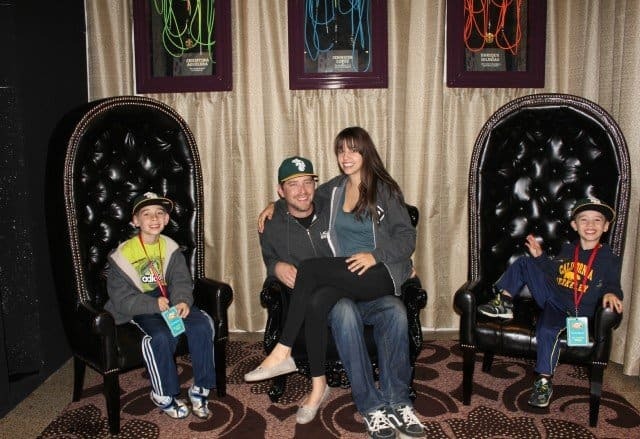 It really was an amazing family vacation! 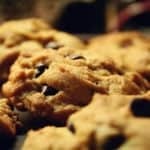 I loved the review, very descriptive and detailed. 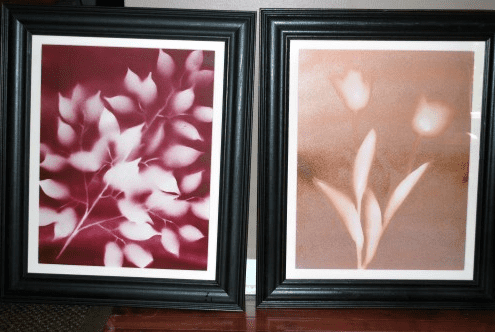 The pictures are beautiful, and show exactly what you are reviewing. 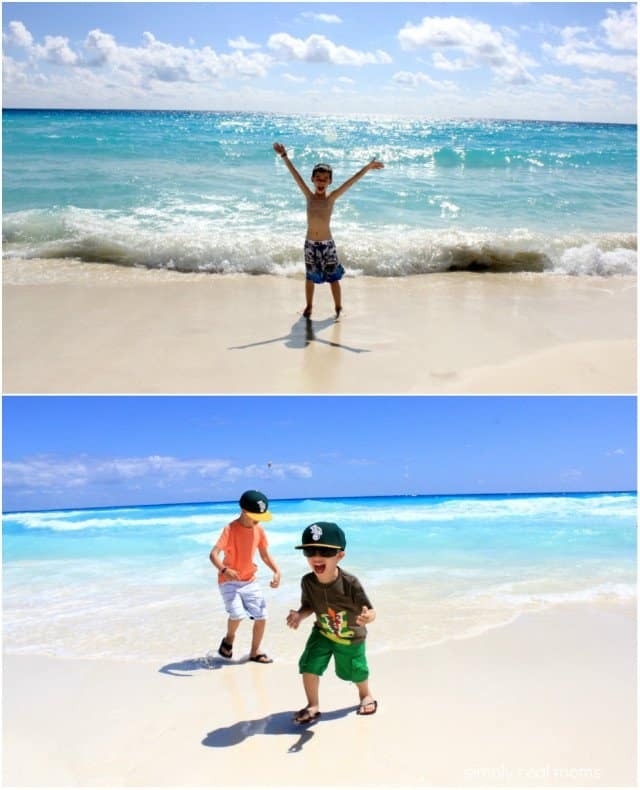 Ok, so now I need a Cancun vacation ASAP! Thank you SO much!!!! 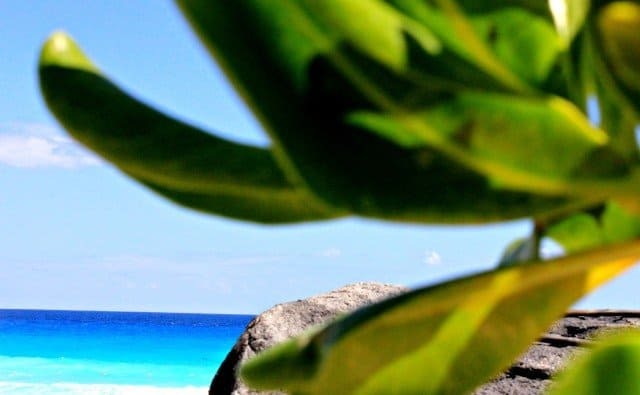 Yes, you definitely DO need to visit Cancun ASAP. You will fall in love! I stayed at the Hard Rock Cancun last April. Loved it! Glad you enjoyed it as well!